Plasters are the most used first aid supplies in the food industry. HypaPlast Blue Catering Plasters are essential for catering environments where 'blue items' are a must helping you to comply with food hygiene legislation, being more visible than other coloured plasters and including a metal detectable strip. These plasters have great resistance to water and other liquid and the quality adhesive ensures that plasters will not lift, even when exposed to some of the cleaning processes used in the food industry. 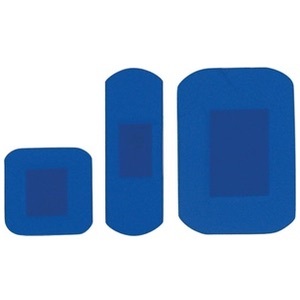 These Blue Catering Plasters also offer maximum comfort and flexibility with a variety of sizes and shapes in each pack. The Assorted Pack of 100 contains an assortment of 100 plasters in 5 different shapes, whereas the Assorted Pack of 20 contains a range of 20 plasters in 2 different shapes. HypaPlast Blue Catering Fingertip plasters are designed specifically for the catering industry to keep any wounds dry and sterile, protecting food products from contamination in the process.